Design360 offers the expertise to turn a great concept or life-long dream into a book. And yes, there’s still a strong demand for beautiful coffee table books. Design360 offers all levels of editorial collaboration and full-service publishing resources including layout, editing, photography, marketing, printing and production. Design360 will register your copyright and ISBN. We have had honor to be a part of some wonderful books featuring engaging places, amazing people and man's best friend. "The documentary and book we have been working on for the past year and a half, Coastal Dune Lakes: Jewels of Florida’s Emerald Coast, is finished and will be shown on Public Television stations in April across Florida and Alabama, then all across the United States in July 2015." 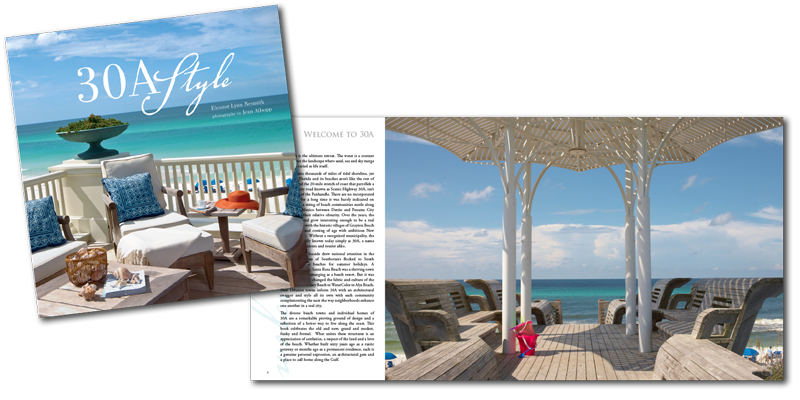 30A Style is a full-color, 192-page coffee-table book highlighting 22 classic cottages and gracious houses in the historic communities and New Urbanist towns that make up the unique 20-mile stretch of beach in Northwest Florida known simply as 30A. Take a journey with author Eleanor Lynn Nesmith and photographer Jean Allsopp as their words and images illustrate why this vivacious, pristine collection of beach towns is so special. Offering both the novice and aficionado of architecture an engaging take on why homes matter to a community and how communities come together, 30A Style is a celebration of a unique way of life along the Gulf of Mexico. The Dogs of 30A is an engaging book of Photography Book Celebrating the Beloved Canines of Florida's Emerald Coast. An always-faithful friend for any adventure, a wet nose nudging under your hand, the look of unbridled love and excitement as you walk through the door at the end of a long day. Humans are a lucky species because dogs exist. The term “man’s best friend” barely scrapes the surface of what these animals mean to us and have meant throughout history. Sled dogs, hunting dogs, herding dogs, police dogs, and seeing-eye dogs are a few examples of their ability to make our lives better. Our Dogs of 30A is a small view at some incredible family members and how they improve our lives daily. Sometimes you have to invent your own miracle. Laurie Beck tells how she created one that saved her life and shows you how you can create a miracle for yourself and by doing so relight the candle of hope and well being. Five years ago Laurie Beck learned to endure against all odds. Her resilience resonates in identifying her adversity as opportunity for inner growth and healing.